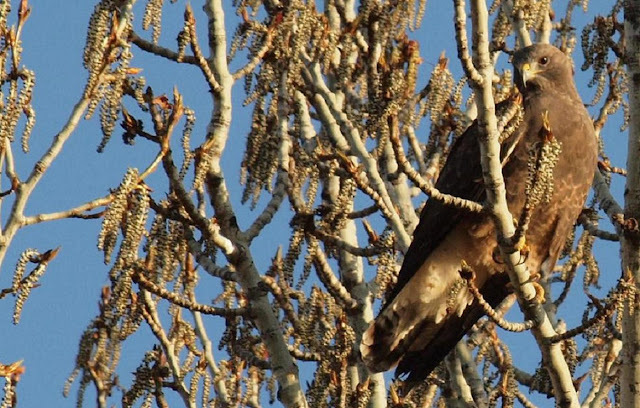 The Swainson's Hawk and I have something in common...living mainly in western North America for most of our lives, occasionally showing up as an eastern vagrant, and spending a critical time of our lives in Argentina. Perhaps that is why the Swainson's Hawk has a special place in my heart. I lived in the provinces of Santa Fe and Entre Rios, Argentina from October 1996 until Sept 1998. Unfortunately, I wasn't a birder then. I remember seeing all kinds of cool birds, but keeping a list was something I had never heard of, nor thought of. Oh well. All the more reason to go back again some day. This time of year, as the Swainson's Hawks prepare to head to our southern home, I get a little nostalgic for Argentina and wish I could hitch a thermal and ride along with them. Not only do they have that sentimental value for me, they are also just really cool hawks. I've watched them hunt and kill. I've seen them seemingly play on the wind. I've observed them mate, build nests, have failed nests, and have successful nests. I've even seen them squirt their pooh...they can really get some distance. It is not unusual this time of year to find an agriculture field full of them perched on the ground, but usually I see them on a power pole. They come in all shades of color and even sizes...I'm assuming larger females and smaller males as in most of the birds of prey. Doesn't he just look tough?! Dark, adult Female Swaison's Hawk - I'm pretty sure I had her nest near my home in the Boise foothills in 2009 and 2010. In 2009, the nest failed, but in 2010 they successfully fledged at least two. Swainson's Hawk being harassed by a Red-winged Blackbird. This in-flight shot shows one easy way to identify this hawk. Notice the large white patches on the front of the wings, with the wide dark trailing flight feathers. New eBird range map - I animated it to show the migration pattern. It appears that some Swainson's Hawks might be wintering in California, the Gulf of Mexico, and in Mexico and not making it all the way down to Argentina. Can any experts out there confirm this? 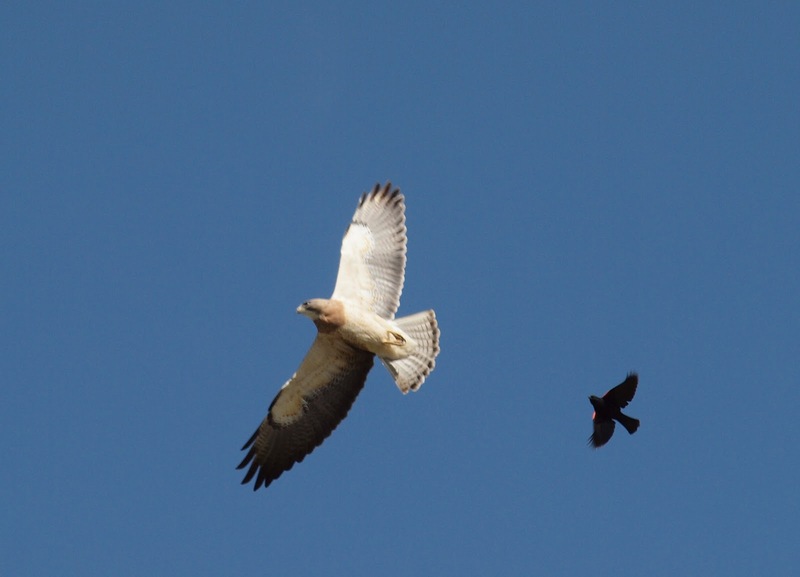 I had been under the assumption that all Swainson's Hawks made their way to Argentina. One thing this map proves is the need for more eBirders in South America! If you look at the purple site markers right on the border of Argentina and Uruguay...that is were I spent quite a bit of my time in Argentina and I'm glad to see some eBirders in that region. It looks like it is November by the time any Swainson's arrive in Argentina and they clear out in March heading north to the breeding grounds. Amazing how a few Swainson's Hawks make it all the way up to Alaska. That is some serious mileage if they go from Argentina to Alaska. Their spring migration northward also seems to be at much faster clip than their much slower trip south. It must be the raging hormones driving them to find nesting grounds and mate, while the trip to Argentina is their vacation from all that family business. One of the Swainson's Hawk kids in my neighborhood - Boise Idaho 2010. Great captures of a majestic bird. I hope to see one someday, on a trip west. Yes, some great shots in there! Swainson's Hawks regularly winter (albeit in small numbers) in central and southern California, and satellite telemetry data indicates that many California breeders actually winter in Mexico, or areas north of Argentina. @Dan - we need to get you out for the Great Salt Lake Bird Festival in May sometime! @Seagull Steve - cool. Thanks for the insight. I wondered about wintering in Mexico too. It'd be interesting to know what percentage of the population winter where. You are so lucky to have these great birds around you. I've only seen two- they are so beautiful! Great post Robert! I love those in-flight shots! 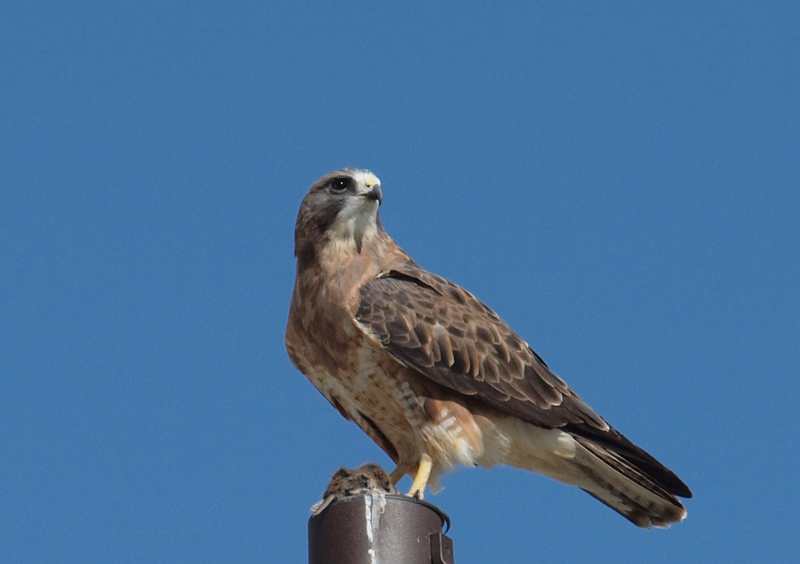 I got my first good looks at a Swainson's Hawk in Sierra Valley back in May. They are listed as threatened in California. What a beautiful bird and a delightful post.